Mother Teresa loved, and that is the quality we attribute to the quintessential Mother. Love that is not selfish but self-sacrificing is what we yearn for from our mothers and mother figures. A Catholic nun, Mother Teresa traveled to India in 1948 and, although an Albanian born in Kosovo, she adopted Indian citizenship. 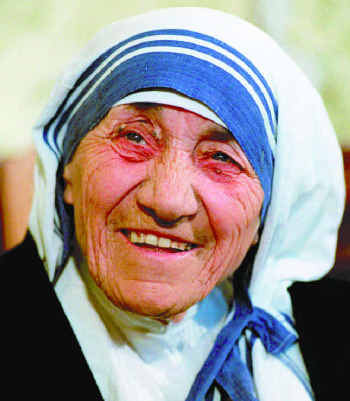 She formed and headed an organization called Missionaries of Charity in Calcutta, whose mission it was to live amongst and help the poor, sick, abandoned, and starving. Now that's a mother who cared! She is given credit for a poem called Anyway that is written on the wall of the Mother Teresa's Calcutta children's home, but was actually written by a man named Kent M. Keith and titled The Paradoxical Commandments. She died in 1997, at the age of 87--a very well-respected public figure. Go to her Wikipedia Page. See her Books. See Keith's poem here, it's very moving. She truly lived her life as an act of service. What a beautiful example for all of us! What a lovely tribute to someone who personified generosity and love.